Don’t miss Black Diamond’s premier Christmas event! Welcome @ Museum with Mayor Carol Benson, Enumclaw School Superintendent, Mike Nelson. SANTA ARRIVES! Santa, Mrs. Claus & Frosty the Snowman will be greeting kids and families, hay wagon rides along Railroad Avenue, live music, cotton candy, wreath-making and art projects, hot drinks and popcorn and much more! 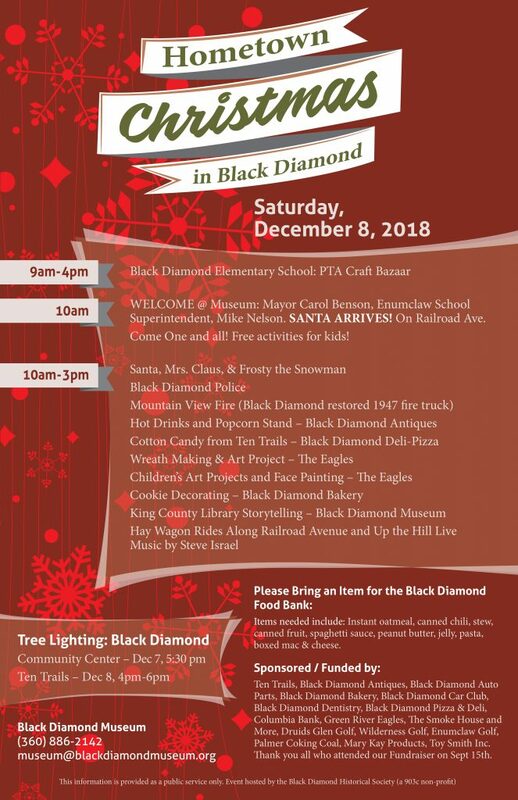 We are excited to partner with the Black Diamond Historical Society for their annual Hometown Christmas event! Following all the fun activities in downtown Black Diamond, head to Ten Trails for an evening of free, family-friendly fun! We will have carolers, selfies with Santa and Mrs. Claus, cookies, hot chocolate and SANTA LIGHTING OUR CHRISTMAS TREE! The tree lighting will take place at approximately 5:30 pm in the Village Green Park.